Fearing further breakdown of order on campus, the management of the Federal University, Oye Ekiti, has closed down the institution indefinitely. Oyeyimika Koyejo-Fasakin, the university’s acting registrar, said the school would remain closed until there was assurance of tranquility. 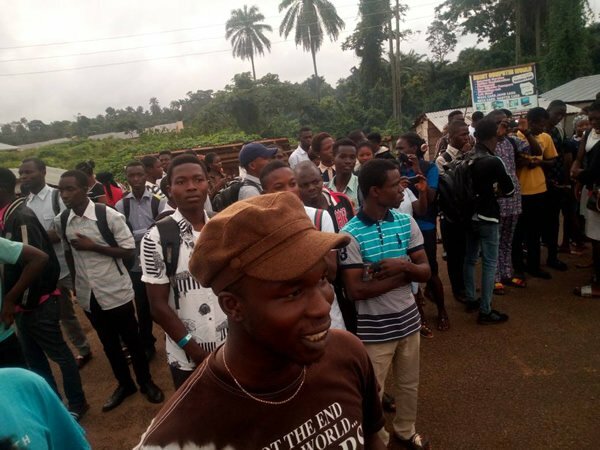 The students started the protest on Monday, insisting that they be allowed to write their semester examinations, despite the fact that majority of them had not paid their fees. Read Also: FUOYE Students Protest Over Varsity’s ‘No School Fees, No Examination’ Policy. But the Acting Registrar in a statement said the management had earlier given three free lecture days for the aggrieved students to organize with their parents to complete payment of fees. The statement said, “The University Management has noticed with concern the evolving issues which surround the students’ protest as regards the ongoing semester examinations. “The management has responded by acceding to most of the demands which have spawned the protests. “And as a mark of further goodwill, the Vice-Chancellor was billed to hold a meeting with the students’ representatives at 13:00 hours on Tuesday, 15th May 2018. “Prior to all these, management had granted a 3-day lecture free period to allow students organise with their parents and guardians as regards their fees. “But despite all these measures of goodwill, some of the students have still decided to turn the University into a theatre for disco music and other non-academic activities which have the potential to cause a breakdown of law and order.